Recorded as Tilly and Tilley, this unusual English medieval surname has four possible and well-documented origins, any one of which is applicable to modern-day namebearers. The first of these is locational and French. Introduced by the Normans after the Conquest of 1066, it may be from any of the various places in Northern France called Tilly, with the first recorded instance of the surname being from Normandy, as shown below. 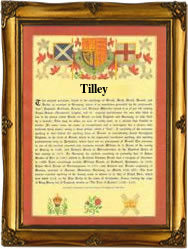 The second source is also locational but this time English and from the village of Tilley in Shropshire. In this case the deriavtion is from the Olde English pre 7th century word "telge", meaning a branch or bough and "leah", wood or clearing. The third possible origin is from the Middle English word "tilie", and as such was a nickname applied to a "husbandman", the early name for a farmer, and meaning a tiller of the soil. The final source is as a metronymic, from the medieval female personal name Tilley or Tilie, diminutives of "Till", from the famous personal name Matilda, the wife of William, the Conqueror. The first recorded spelling of the family name is shown to be that of Ralph de Tilio. This was dated 1086, in the Domesday Book of Devonshire, during the reign of King William 1st, 1066 - 1087. Surnames became necessary when governments introduced personal taxation. In England this was known as Poll Tax. Throughout the centuries, surnames in every country have continued to "develop" often leading to astonishing variants of the original spelling.